New data from ground-based telescopes show that the atmosphere of Jupiter quickly changes due to changes in the solar wind, and that these changes descend deeper into the atmosphere than expected. …”What is startling about the results is that we were able to associate for the first time the variations in solar wind and the response in the stratosphere – and that the response to these variations is so quick for such a large area,” said JPL’s Glenn Orton, co-author and part of the observing team. Within a day of the solar wind hitting Jupiter, the chemistry in its atmosphere changed and its temperature rose, the team found. An infrared image captured during their observing campaign in January, February and May of 2017 clearly shows hot spots near the poles, where Jupiter’s auroras are. Considering Jupiter’s size, for these effects to extend so quickly really is startling. The image on the right, cropped to post here, was taken by Juno on February 12, 2019 as the spacecraft made its 17th close approach of Jupiter. The Juno science team today has highlighted this version, processed by citizen scientists Gerald Eichstädt and Seán Doran to enhance the details therein. They note how the white clouds can clear be seen sitting above the colored clouds below. I cropped it to show the center of the storm. The full image is equally spectacular, as it shows the full storm. Unfortunately, there is no scale, but I suspect you could probably fit the entire Earth several times across the diameter of the storm. Cool movie time! Citizen scientist Gerald Eichstädt has created a movie of Juno’s most recent close fly-by of Jupiter on December 17, 2018. The movie is made from 30 Juno images. I have embedded the video below the fold. It is truly spectacular. Cool image time! Citizen scientists Gerald Eichstädt and Seán Doran have released two new images that they have processed from the Juno raw image archive that were taken during the most recent spacecraft fly-by of Jupiter. 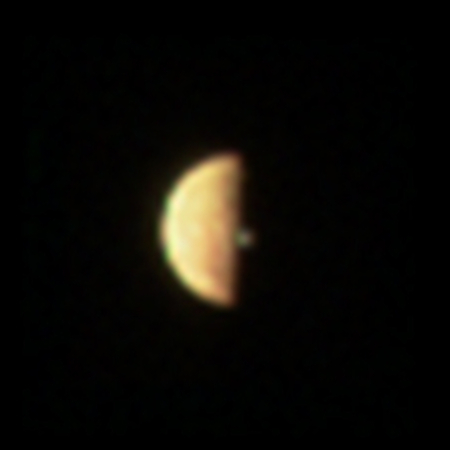 The image to the right, cropped and reduced to post here, shows the Spot as the spacecraft was flying past. If you click on the image you can see their full image, processed by them to bring out the details and colors. Even more spectacular, though unfortunately much too short, is the gif animation they have produced combining a number of images from this fly-by. I have embedded this animation below the fold. If you watch closely, you can see the rotation of this gigantic storm, including the motion of the jet streams within it. Cool movie time! Citizen scientist Gerald Eichstädt has created a time lapse movie using the images taken by Juno during its sixteenth close fly-by of Jupiter on October 29, 2018. The movie is embedded below the fold. Quite spectacular. The colors are enhanced to bring out the details, and begins looking down at Jupiter’s north hemisphere at night. Cool image time! The photograph on the right, reduced to post here, was created by citizen scientists Gerald Eichstädt and Seán Doran from the raw images taken by Juno during the spacecraft’s 16th close fly-by of Jupiter on October 29, 2018. If you click on it you can see the full resolution image. At the time, Juno was about 4,400 miles (7,000 kilometers) from the planet’s cloud tops, at a latitude of approximately 40 degrees north. What attracts me to this image is its dimensionality. First, it looks at Jupiter from an oblique angle. Second, the shadows of the upper clouds can clearly be seen being cast on the lower clouds. Third, if you look at the full resolution image you can even see this effect in the middle of the big white storm in the image’s top left. What frustrates me about this image is that Juno is not in an orbit around Jupiter allowing it to make extended movies of the evolution of these cloud features. Gaining even a limited understanding the meteorology of this gas giant will simply not be possible until we can do this, and that will require many satellites orbiting the planet. New data from Juno has revealed that Jupiter’s magnetic field acts like it has three poles, one at each pole and another near the equator. If Earth’s magnetic field resembles that of a bar magnet, Jupiter’s field looks like someone took a bar magnet, bent it in half and splayed it at both ends. The field emerges in a broad swath across Jupiter’s northern hemisphere and re-enters the planet both around the south pole and in a concentrated spot just south of the equator, researchers report in the Sept. 6 Nature. “We were baffled” at the finding, says study coauthor Kimberly Moore, a graduate student at Harvard University. They think the multiple poles are a result of the complexity of Jupiter’s inner core, which likely does not have the same kind of organization as a rocky terrestrial planet. Cool image time! The image on the right, cropped to post here, shows the white center of one of the smaller giant storms on Jupiter, taken by Juno. The image was processed by citizen scientists Gerald Eichstädt and Seán Doran. If you click on the image you can see the entire picture, which has a host of spectacular details surrounding the white spot. Unfortunately, they do not provide a scale. Based on past experience, I would guess that this tiny storm probably exceeds the size of the Earth. What makes the image so impressive however are the white cloudtops visible as they swirl around the storm’s center. Sunlight shadows clearly shows that these thunderheads rise above rest of the storm. The full image shows even more fascinating details. It is worthwhile studying, though one can certainly get lost in that vast and turbulent Jupiter atmosphere. The uncertainty of science: New computer models, combined with new data from Juno, suggest that magnetism explains why Jupiter’s colored jet stream bands go as deep below the visible cloud-tops as they do. Recent evidence from NASA’s spacecraft Juno indicates these jet streams reach as deep as 3,000 kilometres below Jupiter’s clouds. Co-researcher Dr Jeffrey Parker from Livermore National Laboratory in the United States said their theory showed that jet streams were suppressed by a strong magnetic field. “The gas in the interior of Jupiter is magnetised, so we think our new theory explains why the jet streams go as deep as they do under the gas giant’s surface but don’t go any deeper,” said Dr Parker. This theory is intriguing, but very tentative, to put it mildly. By culling together data from Voyager 1 and the Galileo orbiter, scientists have created a radiation map of the surface of Europa. …In his new paper, Nordheim didn’t stop with a two-dimensional map. He went deeper, gauging how far below the surface the radiation penetrates, and building 3D models of the most intense radiation on Europa. The results tell us how deep scientists need to dig or drill, during a potential future Europa lander mission, to find any biosignatures that might be preserved. This model, which by the way probably has large margins of error, will be used as a guide by the Europa Clipper scientists now planning that orbiter’s mission. Worlds without end: Astronomers, while searching for objects in the Kuiper Belt, have discovered 10 more Jupiter moons. All the newfound moons are small, between about 1 and 3 kilometres across. Seven of them travel in remote orbits more than 20 million kilometres away from Jupiter, and in the opposite direction from the planet’s rotation. That puts them in the category known as retrograde moons. The eighth moon stands out because it travels in the same region of space as the retrograde moons, but in the opposite direction (that is, in the same direction as Jupiter’s spin). Its orbit is also tilted with respect to those of the retrograde moons. That means it could easily smash into the retrograde moons, pulverizing itself into oblivion. It may be the leftovers of a bigger cosmic collision in the past, Sheppard says. Jupiter’s moons are named after gods with connections to the mythological Jupiter or Zeus. Sheppard has proposed naming the oddball Valetudo, after one of Jupiter’s descendants, the Roman goddess of hygiene and health. The ninth and tenth newfound moons orbit closer to Jupiter, moving in the same direction as the planet. I predict that these are not the last moons of Jupiter to be discovered. As our observing skills improve, more are certain to pop up. Cool image time. Mathematician and software programmer Gerald Eichstädt has released another movie using images from Juno’s thirteenth close fly-by of Jupiter. The movie covers two hours of this flyby in 125-fold time lapse, the time from 2018-05-24T04:41:00.000 to 2018-05-24T06:41:00.000. It is based on 27 of the JunoCam images taken during the flyby, and on spacecraft trajectory data provided via SPICE kernel files. The view begins by looking down at the northern hemisphere, and gets to within 2,200 miles of the giant planet’s cloud tops. NASA has extended the Juno mission through 2022 in order to complete its planned science. NASA has approved an update to Juno’s science operations until July 2021. This provides for an additional 41 months in orbit around Jupiter and will enable Juno to achieve its primary science objectives.Juno is in 53-day orbits rather than 14-day orbits as initially planned because of a concern about valves on the spacecraft’s fuel system. This longer orbit means that it will take more time to collect the needed science data. I will admit that though Juno is clearly learning a great deal about Jupiter, such as this story about lightning there, its larger orbit makes it difficult to track the gas giant cloud structures as they evolve. This is unfortunate. Using old Galileo data and new techniques of analysis scientists have uncovered a water plume on Europa that the spacecraft flew through in 1997. Over the course of 5 minutes, spikes the spacecraft recorded with its magnetic and plasma sensors reflected the alterations that a veil of ejected water, from one or many vents, could cause in a region matching the telescope observations, they report today in Nature Astronomy. This indicates that a region of the moon potentially 1000 kilometers long could host such activity, though it is impossible to say whether this is a single plume or many, like the complex system of fractures and vents seen on Enceladus. Indeed, on its own, this evidence was too weak to tie to erupting water in a 2001 study describing it, the authors add, but it fits well with the Hubble and modeled evidence. As indicated by the quote above, the result has a lot of uncertainty. Several Juno images that have been cleverly processed by citizen scientists are being highlighted at a Jupiter conference being held in London this week. I have myself highlighted images by both previously at Behind the Black, here and here and here and here. This press release nicely places both in the limelight at last. The Juno science team has released an animation that shows, in infrared and in three dimensions, the storms of Jupiter’s north pole. The link has three videos. One shows the gas giant’s surprisingly irregular magnetic field, as found by Juno. The first and third show a low and a high fly-over of the north pole, in infrared. I have embedded both fly-overs below the fold. First watch the high fly-over, which is the first video. This will make the low fly-over more understandable as it flies over the eight smaller storms that encircle the pole’s central vortex. Cool image time! Yesterday I posted a short gif created by citizen scientist Gerald Eichstädt, using twelve Juno images, that showed some cloud changes over time. Today, I discovered that Eichstädt has created an even more spectacular movie, which I have embedded below the fold, based on images taken during Juno’s tenth close fly-by. This movie shows the short-term dynamics Jupiter’s southern storms derived from raw JunoCam images of Juno’s Perijove-10 flyby on Dec 16, 2017. You might also notice the effect of changing solar illumination on the appearance of the haze bands. JunoCam usually takes a time-lapse sequence of images during each perijove showing Jupiter’s polar regions. These images are taken from different perspectives along Juno’s trajectory. But it’s possible to reproject the JunoCam images to a common perspective. 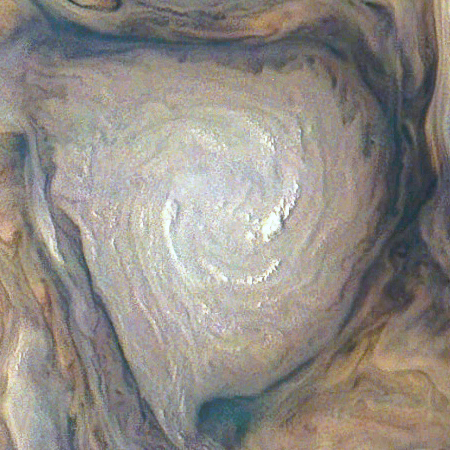 Displaying such a sequence rapidly reveals cloud motion in Jupiter’s storm systems. This movie applies this technique. At the same time, it is changing the simulated perspective along Juno’s trajectory. The same short sequence of images is displayed in a loop, but due to the changing way of reprojecting the raw images, the shown surface area is changing more or less continuously. Eichstädt warns that the blinking nature of the film might make it unsuitable for those with epilepsy. 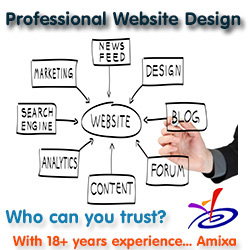 If this is not an issue for you, you should then definitely take a look. Cool image time! Citizen scientist Gerald Eichstädt, using twelve Juno images, has compiled a short gif movie that shows a tiny amount of cloud movement. When you watch, zoom in on the upper right quarter. This is the area that the cloud motion is seen best. Scientists had not expected the atmosphere go that deep. Other results show that that the gas giant’s complex polar regions are surprising as well. Its north pole is dominated by a central cyclone surrounded by eight circumpolar cyclones with diameters ranging from 2,500 to 2,900 miles (4,000 to 4,600 kilometers) across. Jupiter’s south pole also contains a central cyclone, but it is surrounded by five cyclones with diameters ranging from 3,500 to 4,300 miles (5,600 to 7,000 kilometers) in diameter. Almost all the polar cyclones, at both poles, are so densely packed that their spiral arms come in contact with adjacent cyclones. However, as tightly spaced as the cyclones are, they have remained distinct, with individual morphologies over the seven months of observations detailed in the paper. I am always baffled when scientists are surprised at the infinite variety of the universe. It is absurd to assume Jupiter and Saturn would be alike, especially considering the history of solar system exploration since the dawn of the space age. Since the first probe got a close look at the Moon, every single new object observed has been completely different from every other previously observed object. Every object has been unique. None have been the same. Jupiter should be no different. And I guarantee that the next fifty gas giants we finally get a close look at out there among the stars will be as different from each other as they are from Jupiter. It is going to take a lot of exploration for us to finally get a handle on the overall patterns of planetary formation. Due to Jupiter’s low axial tilt we never see more than roughly one half of the area around the poles in sunlight at any given time. However, it is interesting to see what Jupiter’s polar regions would look like if things were different and a big area around the poles was illuminated. This rotation movie shows what Jupiter’s south polar region would look like near the time of southern summer solstice if Jupiter’s axial tilt was much greater than it is, i.e. comparable to Saturn’s axial tilt. He also notes the puzzling fact that, though Jupiter and Saturn are both gas giants, unlike Saturn Jupiter does not have a vortex at its poles. In fact, he points out how none of Jupiter’s storms are centered at the pole. 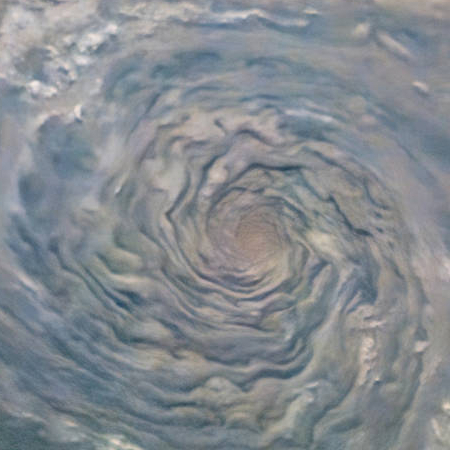 Why one gas giant should have such pole-centered vortexes while another does not is a big mystery that illustrates how very little we know about planetary formation and evolution. The two rotations also do not show any changes in the storms, not because they aren’t changing but because the images used were taken over too short a time span to show this. Scientists reviewing twenty year old data from the Galileo orbiter that studied Jupiter and its moons in the 1990s have identified the most intense volcanic eruption yet found on Io. There’s only one likely explanation for what the instruments saw, explained Davies, whose volcanic expertise starts here on Earth. Large, violent eruptions like those seen at Stromboli are capable of spewing huge masses of tiny particles into the air, which cool quickly. The article makes it sound like we’ve never seen this kind of eruption on Io before, which isn’t really true. Such eruptions have been imaged, but this is the first time that infrared data of their temperature spike was captured, thus confirming its nature. Cool movie time! In conjunction with the release yesterday of data from Juno’s first close fly-over of Jupiter’s Great Red Spot, the science team also released an animation of what it would be like to fly down into the Spot. You can also download the mp4 file here. It is definitely worth watching. It illustrates forcefully how daunting and challenging it will be for the human race to ever explore the vastness of Jupiter. This simulated plunge only goes into the Great Red Spot a few hundred miles, and barely touches its dynamics. The Juno science team released its results from the spacecraft’s first close fly over of Jupiter’s Great Red Spot in July 2017. The storm’s estimate depth, about 200 miles, seems gigantic, but then we must remember this storm is on a gas giant that is about 88k miles in diameter, about ten times larger than Earth. The relative size of this storm to the size of Jupiter therefore is really not that much different than the relative size of big hurricanes on Earth. 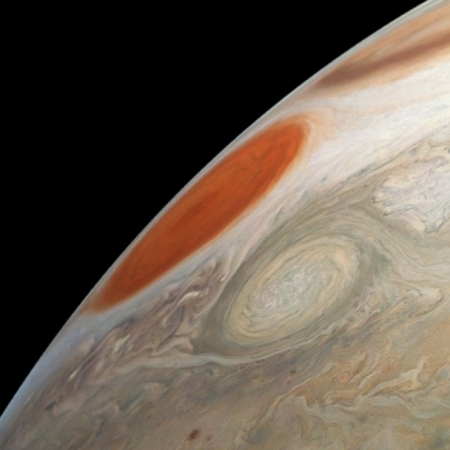 At the same time, the realities here are daunting, filled with unknowns, chief of which is the fact that unlike Earth, the Great Red Spot is a storm that is floating high in the atmosphere with no solid surface below it. Another Juno fly-by movie of Jupiter! Cool movie time! Using 125 Juno images taken when it flew past Jupiter on its third orbit in December 2016, citizen scientist Gerald Eichstädt has produced a beautiful short movie showing that flyby. I have embedded it below. Most repetitive bright and dark camera artifacts are patched. Due to the intense radiation near Jupiter, several additional bright pixels occured. Those aren’t patched in this animation. Cool image time! 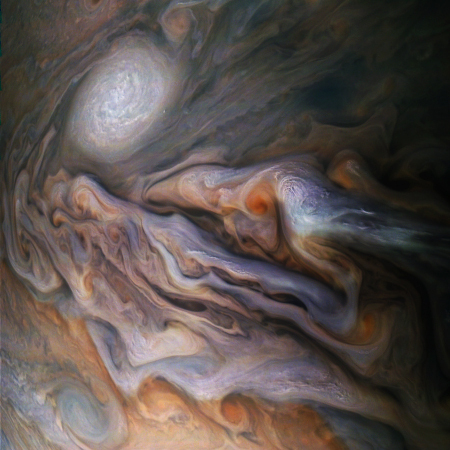 The image above, reduced in resolution to post here, was taken during Juno’s ninth close fly-by of Jupiter in late October, and shows one particular storm swirl in the gas giant’s southern hemisphere. The Juno team today highlighted an image taken during this fly-by of Jupiter’s entire southern hemisphere, but I find this close-up more interesting. Be sure to check out the full resolution version. It appears to me that the white swirls have risen up above the gold and blue regions, casting shadows down upon them. Unfortunately, I cannot tell you the scale of this storm, as the release does not give any details, including where in the full hemisphere image it is located. I suspect, however, that it is large enough to likely cover the Earth. Both the full hemisphere image and the image above were processed by citizen scientists Gerald Eichstädt and Seán Doran. Data from Juno not only suggests that the gas giant has a small fuzzy core, its storms appear to extend thousands of miles into the interior. By studying Jupiter’s gravitational field, researchers can probe thousands of kilometres into the planet. On each close fly-by, Juno measures the planet’s complex gravitational tug. These observations have already revealed that Jupiter has a small, ‘fuzzy’, poorly defined core. Juno detected a gravity signal powerful enough to indicate that material is flowing as far down as 3,000 kilometres. “We’re just taking the clouds and the winds and extending them into the interior,” Kaspi said. Future work could help to pinpoint how strong the flow is at various depths, which could resolve whether Jupiter’s interior really resembles Russian dolls. What is especially fascinating is that this first study of Jupiter shows it to appear so very different than Cassini’s first look at Saturn. Their polar regions are completely different, their storms are different, even their horizontal bands behave and look different. As I’ve said numerous times, the one given in planetary exploration is that every single planetary object we look at will be completely different from every other object. Another citizen scientist who goes by the moniker of mesno has uploaded a spectacular 3D anaglyph of one of Juno’s images of Jupiter. I could post it here, but I’d have to reduce its resolution, and I don’t think this will work well. If you have red-blue anaglyph 3D glasses the image does a great job of showing the differing vertical heights of Jupiter’s many horizontal bands, especially since it exaggerates the vertical scale significantly to bring out these differences. Mesno has done three other anaglyphs. Check them out. The image of the Great Red Spot really shows how this is a vast whirlpool boring deep into Jupiter’s atmosphere. Citizen scientist Gerald Eichstädt has done it again, assembling and enhancing the images taken by Juno in its September 1, 2017 fly-by of Jupiter to produce a spectacular movie, embedded below. This animation reconstructs the two and a half hours from 2017-09-01T20:45:00 to 2017-09-01T23:15:00 in 125-fold time-lapse with 25 frames per second, using 20 raw JunoCam images. JunoCam is Juno’s optical and near infrared Education and Public Outreach camera. Trajectory data are retrieved from SPICE kernels via the NAIF spy.exe tool. The NAIF/SPICE environment is the way NASA provides spacecraft navigation data. The movie shows Jupiter in a heavily enhanced way, in order to reveal detail. Some of the raw images cover only part of the area required to render a still of the movie. In these cases, you’ll see the border of the raw image. Each image is rendered into a short scene. The scences overlap and are blended. Rendering the movie took about five days. Any shortcomings of the movie are a result of imperfect image processing. 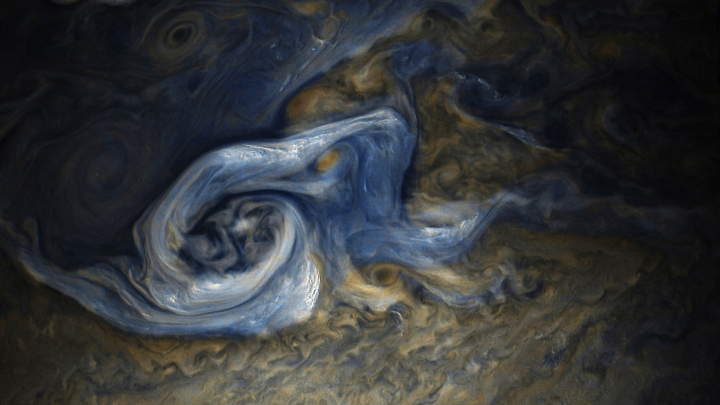 Gerald Eichstädt at the Juno image site has produced the first attempt to assemble a movie of Juno images of the same area on Jupiter in order to show its changing weather. JunoCam has been seeing this scene about six times from very different perspectives between about 2017-09-01T22:03 and about 2017-09-01T22:19, hence a over a little more than 15 minutes. This animation is a first attempt to reproject the six images to a similar common perspective in order to reveal some dynamical information. An movie covering only 15 minutes won’t show much change, but it is a start. He also notes that in making the different images match up he likely introduced some artifacts that are not real.